7 Best Hotels In Antalya For Muslim Travellers – With Great Rates! Antalya is an uprising destination in Turkey that has started receiving the attention of travellers from all over the world. It is a gorgeous coastal city that has a long line of clean, white sandy beaches and breathtaking turquoise ocean water. If you have never been to this place before, you should consider it! Make your plan and book one of these 7 best hotels in Antalya for Muslim travellers that offer excellent room rates. This five-star hotel overlooks the Mediterranean Sea and provides you with the view of the ocean and the Taurus Mountain. It is one of the hotels in Antalya Turkey that offers Halal breakfast and alcohol-free minibar in the guest room. If you are to stay at Hotel Rixos Downtown during your Halal vacation in Turkey, you will be able to go to some of the top places in the city by foot. Antalya Museum, Aqualand, and Beach Park Konyaalti are just about 1.5km away from this top hotel. Adenya Hotel & Resort is an Islamic hotel in Antalya that aims of providing a memorable holiday experience to Muslim families. It is, indeed, one of the best hotels in Antalya for Muslim travellers that is ideal for you to book. Adenya Hotel serves 100% halal food and the pools at the hotel are separated for men and women. You will definitely enjoy staying in one of its luxurious guest rooms and looking at the beautiful ocean since it is located right on the shore of the Mediterranean Sea. Would you like to stay in a five-star hotel that offers tons of fun experience to you and your family? Then, you should consider Fame Residence Lara & Spa. This luxurious hotel offers top-notch facilities and excellent services. Here, your family will enjoy staying in its super large hotel room, exploring one of the sports facilities such as tennis court, football field, and pool slides. You can also enjoy dining at its Halal restaurants that serve Turkish, Chinese and Italian cuisines. Mr & Mrs Halal Note: If you wish to stay here, make sure to make an early booking to avoid disappointment – the hotel gets sold out quite fast! 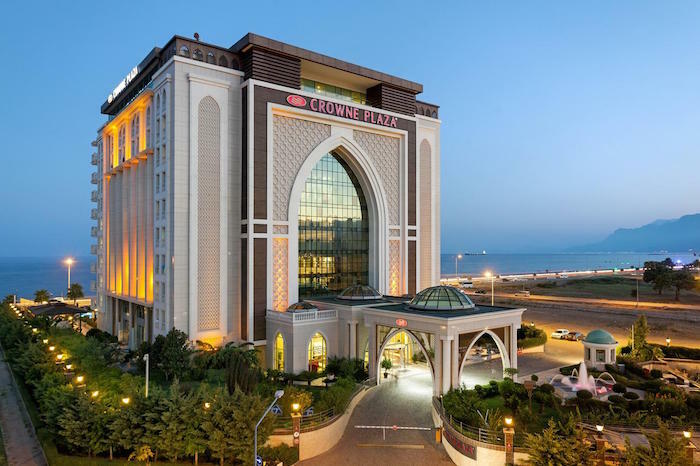 Crowne Plaza Antalya is a modern, five-star hotel in Antalya that you can choose for your holiday. It first grabs your attention with its stunning and grand Islamic architecture. 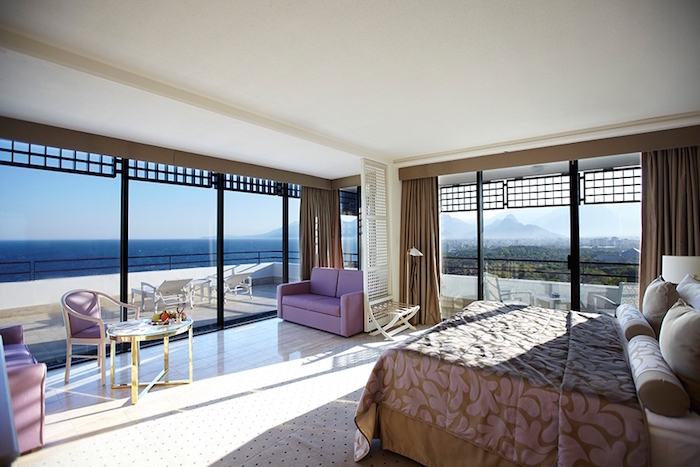 The guest rooms have new furnishings and come with a balcony – you can enjoy the sea view from here! Since it is also a Muslim friendly hotel, you can enjoy its Halal breakfast at one of the three restaurants at this hotel. It is an ideal hotel for Muslim newlyweds who would like to enjoy a Halal honeymoon in Antalya. Spa centre, children playground, big-sized pool, and excellent Halal buffet are some of the things that you can enjoy if you choose to stay at the Wind of Lara Hotel & SPA in Antalya, Turkey. Many Muslim travellers and Muslim families love to stay at this hotel, not only because of its great room rates but also because of its fantastic service and facilities. 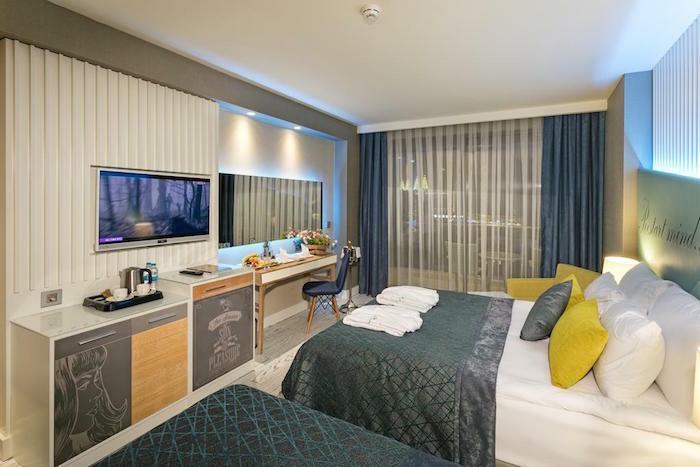 You will enjoy staying in its luxurious rooms, relaxing at its sauna spa, or spending quality time with your kids at the outdoor pool or table tennis area! 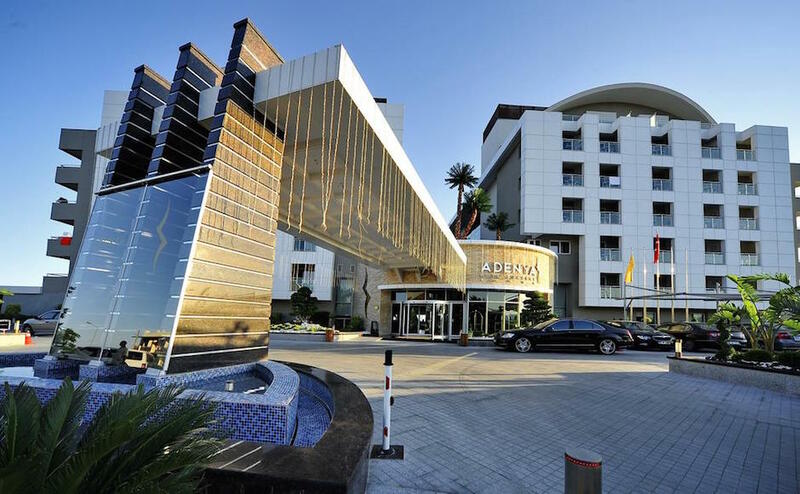 Akra Hotel is also one of the best hotels in Antalya for Muslim travellers that you can consider. It has received good reviews from many of its previous guests. This five-star hotel overlooks the Mediterranean Sea and also provides a relaxing and scenic view of the Taurus Mountain. The hotel rooms can cater to both Muslim couples as well as Muslim families. 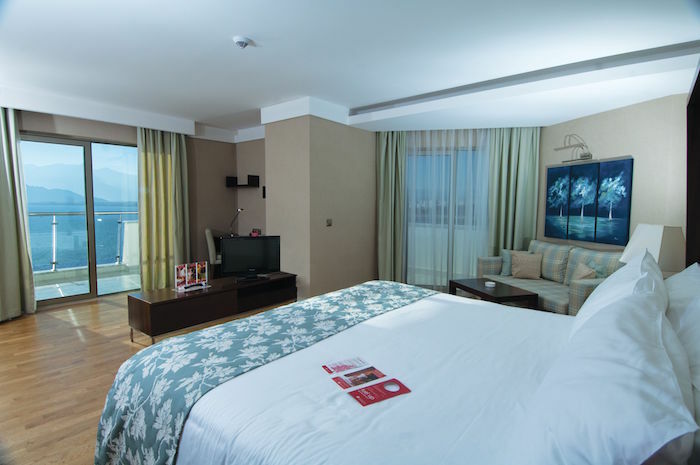 You can choose to either book the Deluxe room or the Family Suite if you are going to Antalya with your spouse and children. The amenities at this hotel are complete and luxurious. The fact that it is near to the Old Town, shopping malls, and other attractions make it a great hotel for Muslim travellers! 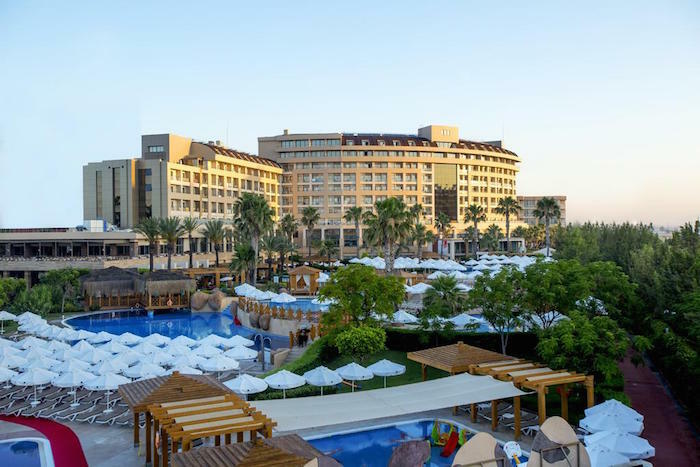 If you’d like to stay near the city and close to the ocean, we recommend you consider the top five-star hotel in Antalya – Ramada Plaza Hotel. It is located right by the ocean and only 5 minutes away from Kaleici (the Old Town). It is one of the best hotels in Antalya for Muslim travellers that can provide you with a relaxing beach holiday in Turkey. You will be able to enjoy its big and well-furnished hotel room, dine at its Halal restaurants, and unwind by the beach or at the hotel’s pool. If you need more tips on Antalya, Turkey, then check out this Muslim friendly travel guide to Antalya.